What are the oldest phonograph recordings in North America? Here's a hint: they predate Thomas Edison's "Mary Had a Little Lamb" (1877) by at least 12,000 years. 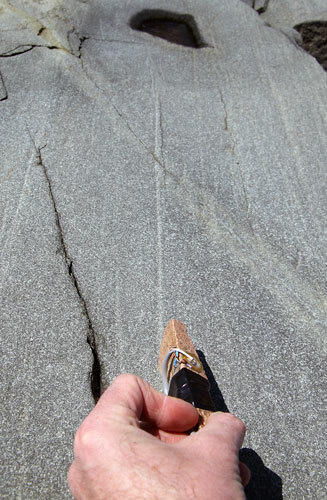 During the Wisconsin Glacial Episode, rock fragments carried along by the mile-thick ice sheet carved countless miles of linear grooves, or striae, into the hard bedrock. When the ice finally retreated about 12,000 years ago, it left behind a storehouse of planetary knowledge encoded in the bedrock grooves that are now visible all across North America. How do we listen to these recordings? And what messages do they contain? Playing the rock (here, a basaltic intrusion into the granite basement). 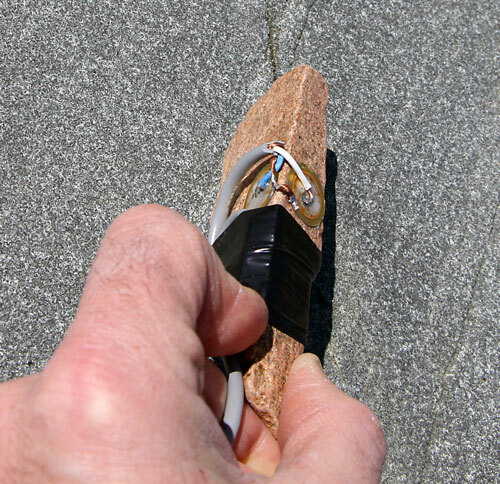 Closeup of stereo pickup, made of local pink granite.